To download a PDF copy of the dinner menu – click here. 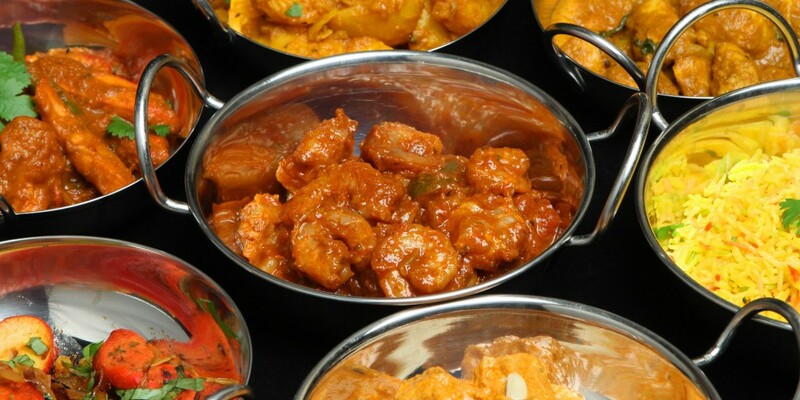 An assortment of King Prawn, Lamb Sekuwa, Tandoori Chicken, Chicken Wings and Chicken Tikka. Fresh homemade chicken mince steamed and served with fresh homemade Nepalese tomato chutney (mix onion, spring onion, ginger, and garlic). Char grilled fresh chicken mixed with cucumber, tomato, lemon juice, chat masala and coriander served in spicy papadum. Fresh breast of chicken coated in breadcrumb and deep-fried. Piece of local fresh chicken breast marinated in rich fresh cream cheese and cashew nut sauce and baked in clay oven. Char grilled succulent Hereford fresh lamb pieces marinated with Nepalese spices. Light spiced marinated King Prawn deep fried with breadcrumb. Homemade potatoes dish touch of chilli and lemon served with fresh salad. Deep fried seasoned onion and mixed vegetables served with salad. Spiced mix seasonal fresh vegetable pastries served with salad. Marinated Chicken, Prawn or Lamb cooked with garlic, ginger, fenugreek leaf, yogurt and fresh coriander. Flavour of sweet mango, mint and yogurt, cooked with homemade masala. “Very Popular Dish” – Fresh stir fried chicken cooked with fresh garlic, chilli and dark soy sauce. Slow cooked fresh chicken with ginger, garlic, onion, tomato, coriander and Nepalese fresh masala. Fresh chicken cooked with onion, tomato, fresh chili and capsicum. Slow cooked fresh Hereford lamb with ginger, garlic, onion, tomato and fresh Nepali masala. Spinach cooked with Chicken or Prawn and fresh Nepali masala. Marinated with masala, ginger and garlic cooked in home Made fresh tomato special Sauce with touch of coriander. Fresh sliced stir-fry chicken marinade with egg, potato flour, white pepper, cooked with fresh garlic, ginger, spring onion and black bean with touch of dark soy sauce. Fresh sliced stir-fry chicken marinade with egg, potato flour, white pepper, cooked with fresh garlic, ginger, spring onion with touch of dark soy sauce. Char grill fresh breast chicken cooked in butter, fresh cream, garnished with plum tomato. All time favourite dished cooked with tomato coconut and fresh cream. Cooked with almond, cashew nut, coconut and cream. Cooked with traditional style, sweet and sour flavour. Cooked in a very hot sauce with potatoes. Traditionally cooked with special sauce of fresh tomato, onion, carrot, garlic and ginger. Cooked with fresh mixed vegetables, tomato sauce, pepper, chilli and soy sauce. Cooked in fry pilau rice and served with mixed vegetable curry. Fresh local chicken marinated in spiced sauce and cooked in a clay oven. Marinated with capsicum, onion and tomato. Breast of chicken marinated in garlic, ginger, double cream, pineapple, mustard oil cooked on clay oven. Salmon marinated with homemade masala and slow cooked in clay oven. King prawn marinade with Chef’s special sauce. Chef’s assortment of various tandoori kebabs. Diced of homemade cheese marinated fresh ground aromatic herbs and spices barbecued with onion, mixed pepper and tomatoes. Seasonal fresh mixed vegetable cooked with Pilau rice and served with mix vegetable curry sauce. Seasonal fresh mixed vegetable cooked with almond, cashew nut, coconut and fresh cream. Cooked with special sauce – sweet and sour flavou. Patato and peas cooked with a touch of cream. Spinach and potatoes cooked with ginger and garlic. Spinach cooked with Nepali style (dry and tasty). Basmati rice cooked in touch of pure ghee. Bread mixed with coconut, almond powder, cherry and sultana. Bread mixed with fresh garlic and corianda. Bread mixed with masala and fresh lamb mince.